I never knew there were so many shades of beige! Currently there are six choices on the wall. Next big decision - CARPET!! On Monday of this week, we closed on our new home. It has been a rocky road from the start. When we first saw this house, it was above our set price range. But we kept thinking about it, and after several offers, we finally came to an agreement with the sellers. So the projects begin. We are planning on doing some painting and maybe even recarpet a couple of rooms before making the final move. But I thought I would share some pictures of the new house. Please note these pictures still show the sellers furniture. I would like to share pictures along the way as we make this house our own. So stay tuned! A few months ago I posted this picture of a warning sign we encountered. There is a store in a nearby town that carries furniture, silk flowers, baskets, and lots of decorating nic-naks. As a matter of fact, that was the inspiration for my blog name! Not only do they have all the above mentioned items, they always have displays which change seasonally. Just thought I would show a few. This one is my favorite. I love the sewing room! Click on any picture to get a closer look. A while back I showed you the red dishes I found at the Goodwill. I loved these made in USA Strawberry Hill dishes. But did I show you the blue ones I found??? Found these at the Goodwill on a recent road trip. I scoffed these babies right up. I think I put off showing them because I have been looking for some pretty clear blue salad size plates to go with these lovelies. And I also have not been able to find out any information about what line they came from. If anyone has an idea of what pattern this is, I'd love to hear from you. 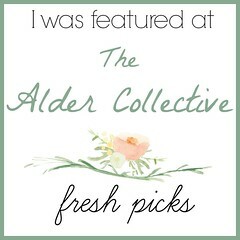 Be sure to pop over to Coloradolady's Vintage Thingie Thursday and see what treasures are in store for this week! I bought this creamy blue breakfast set at an Antique mall last year on a trip to Georgia. I loved it the minute I saw it. I snatched up a basket out of someone else's booth and carefully started stacking these blue beauties. Please visit these love tea parties. Inspired by three decades of state and local celebrations, Flag Day - the anniversary of the Flag Resolution of 1777 - was officially established by the Proclamation of President Woodrow Wilson on May 30th, 1916. While Flag Day was celebrated in various communities for years after Wilson's proclamation, it was not until August 3rd, 1949, that President Truman signed an Act of Congress designating June 14th of each year as National Flag Day. Happy VTT to you! Please stop by and visit Coloradolady's blog. Not only will you enjoy the thrifty treasures shared today, you will follow Suzanne on a vintage hunt like no other. Things are starting to heat up around here with the thoughts of packing up and moving. When you have lived in the same house for as many years as I have, well, it's going to be quite a process. Do you have a favorite serving piece? I have always enjoyed using glassware when I have company. Whenever I am out and about at the thrift stores, I am always on the look out for some pretty piece of glass. So here are some of my thrifty finds. For years I have looked at these glass pitchers, but they were always above my budget. So when I found this one in a little antique shop for $7.00, it seemed like the perfect fit. And my latest find was this Mikasa candle holder during the 50% off day at the thrift store! Please have a seat while I get the water hot. It is always fun to join the other ladies for Tea Time on Tuesday. So many lovely tea parties to attend. What is the problem with words??? I was reading someone's blog lately, and she kind of wrote in code. You know, left a letter out here and there. At the end of her post she said that she did not want to write out certain words because it would draw spammers to her blog. Wow is that true?? Do the spammers pick up on certain words? I have seen an increase in some comments on this blog which appear to be spam, but I cannot figure out what word is attracting them. I thought that with blogger comments, you would have to type in the letters before the comment is posted. So does that mean there are people who just sit at their computers all day and write things (that are probably not nice) on other peoples blogs? an awesome and historical opportunity. On a recent thrift store visit, I saw a picture that just enchanted me. I looked at it several times, but decided that I really did not need another picture. But then I went home. And I saw my piano. And I thought, hey, that picture would look really nice over the piano. So the weekend came and went, and I went back to the thrift store, fully expecting that picture to be gone. I did not see it at first, and I was going to walk away from the area where the pictures are displayed. But I thought I would just take one more look. And there, behind another larger picture was the sweet one I had seen. These two little children just charmed their way into my heart. So the picture went home with me, and right on the wall above my piano. Now the thrift store was having their end of the month sale that day, so the picture was marked 1/2 price. How could I turn down this lovely when it was only $3.50. But the next day, I was in the same area. I knew I did not need to go back to the thrift store, but I just thought I would run in there and look once again. No, I told myself, there really isn't anything else that I wanted. But self got the better of me, and I went anyway. As I walked into the store, talking to myself the whole time (saying, what am I doing here again? ), I saw it! Straight ahead on the wall. I was instantly drawn to it because of the quilt. Being a quilter, quilts of any kind usually catch my eye. I know this picture was not there the day before, so I walked over and took a look. It turns out to be a signed and number print by Sandy Lynam Clough. I took it down and looked it over. The custom frame has three mats. And of course it was still 50% off day, so the $14.99 price was had for $7.50. So I took this little beauty home and hung it in my entry way. What a fun day that was. 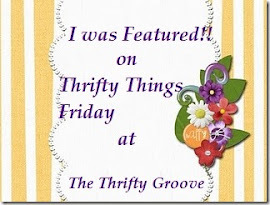 Please be sure to stop by and visit the other Vintage Thingies on Colorado Lady's Vintage Thingie Thursday blog. It is always fun to see what treasures are in store for this week.